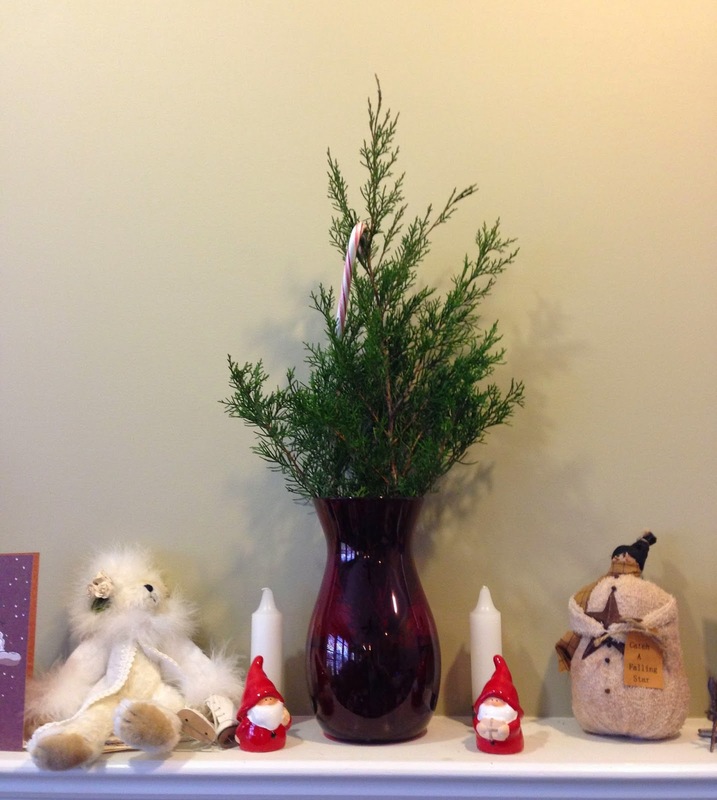 I had minimal decorations out this year for the holidays, but I did have a few items on my mantle...including my "Charlie Brown Tree" and my Nordic Nisse. 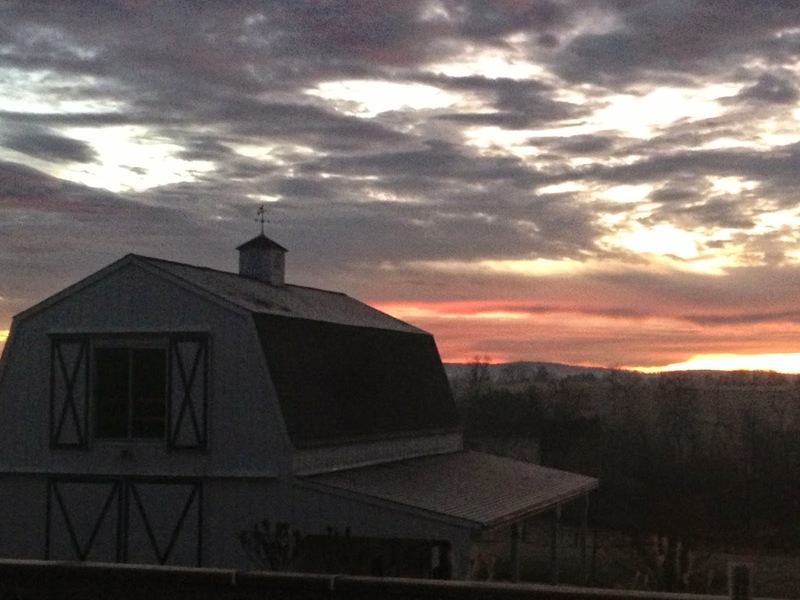 On Christams weekend, there was an absolutely gorgeous sunrise.....very vibrant colors. 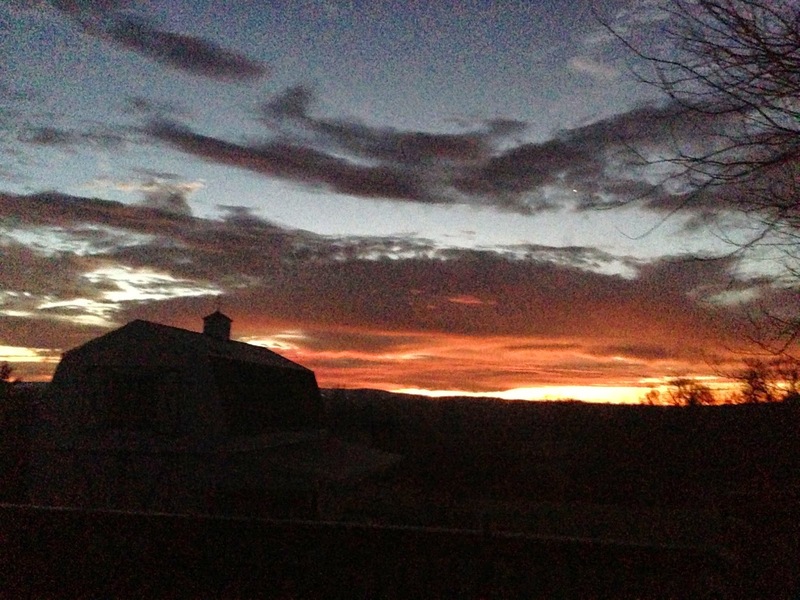 These two photos were taken 15 minutes apart. 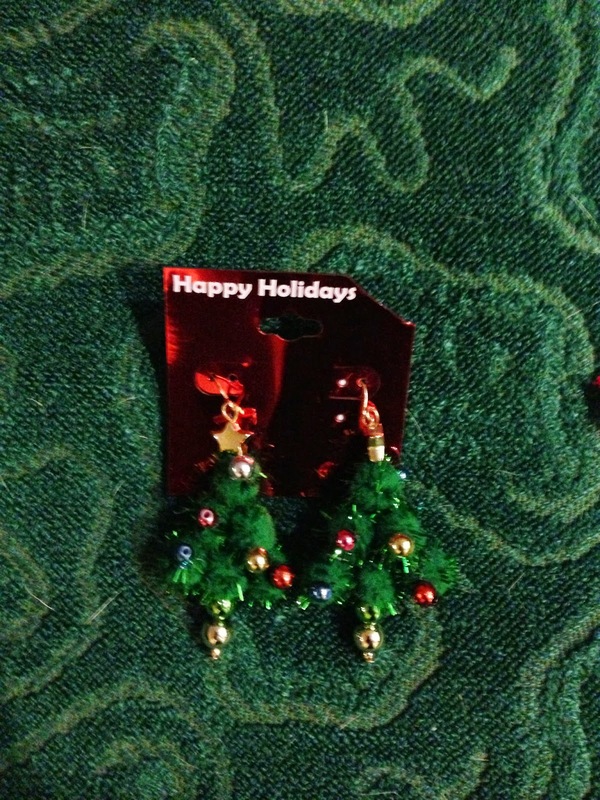 As part of a "de-stress" activity during the holidays, a group of us challenged each other with an "Ugly Christmas Swap" with the "Ugly Christmas Sweater" as the prime example of "Ugly". 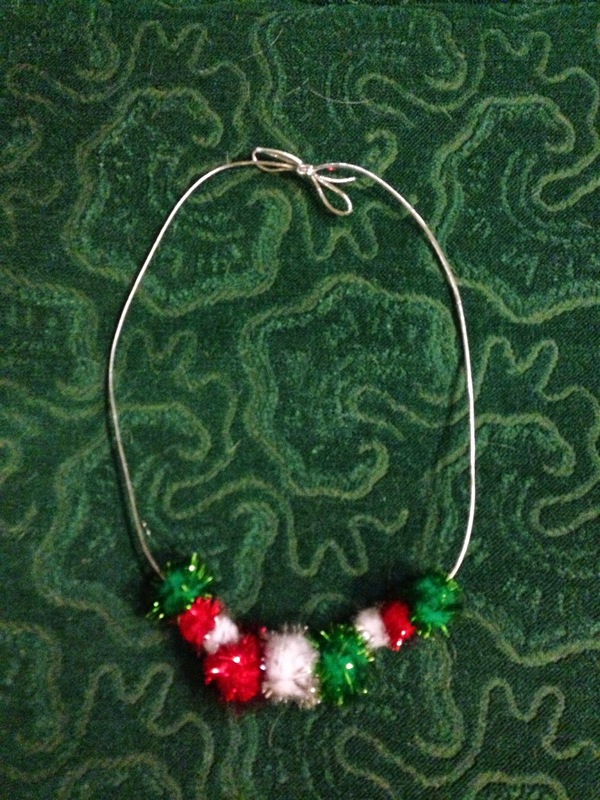 I made my partner an apron and a coordinating necklace to go with the purchased Christmas tree earrings. 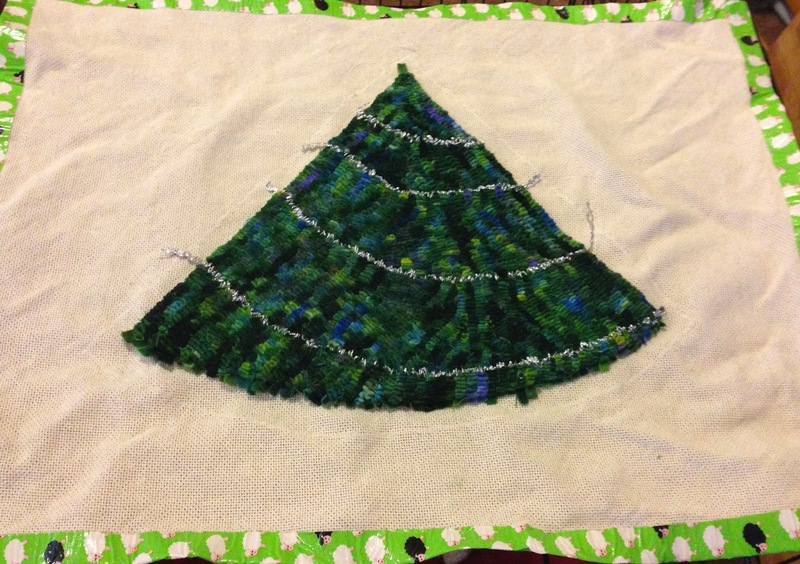 I drew a Christmas tree shape freehand and then cut it out of green felt with glitter. 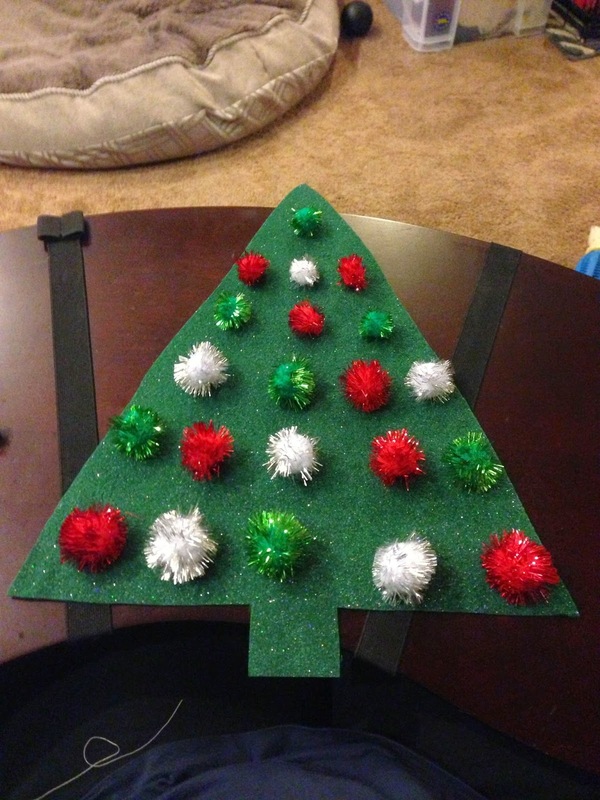 I laid out glittery pom-poms on the tree for bulbs. 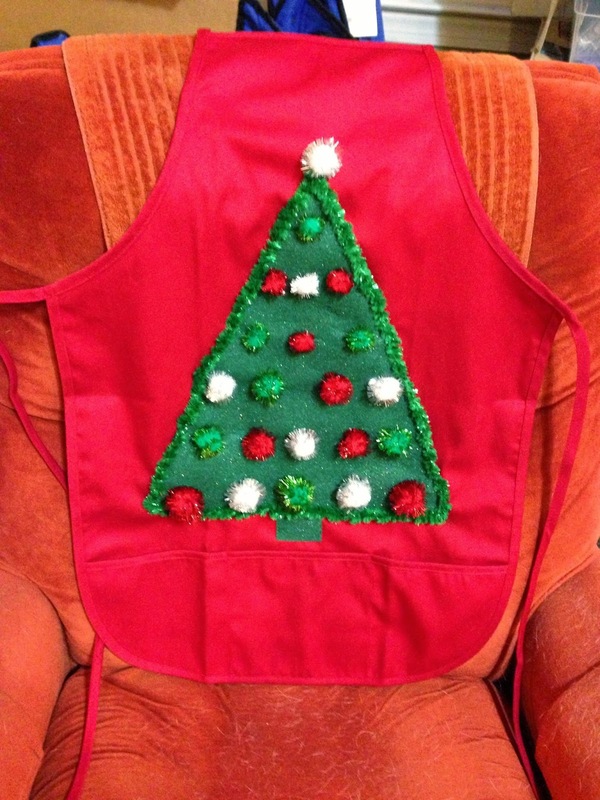 Once all the pom-poms were attached, I stitches the tree to the apron and then outlined it in glittery fluffy "ribbon". It was a lot of fun! Pat crafted a long sleeved shirt for me with the same reindeer as is shown on the serving dish she included in the swap. She even used my favorite color - purple! I think it's awesome - and it's a perfect fit! What a fabulous idea! At our Purls of Distinction holiday party, Carol showed us how to make little hat ornaments from the thrums left over from weaving! For those that don't weave, there is quite a bit of yarn left on the loom when you complete a woven project. This yarn can be from about 1/2 yd. to a yard in length. Rather than wasting the yarn, you can use a the cardboard tube from toilet paper roll or paper towel roll and cut it into 1/2" lengths. Then, you loop lengths of yarn around the tube (like attaching fringe) until the tube is covered. You then push the ends through the tube and out the other side. 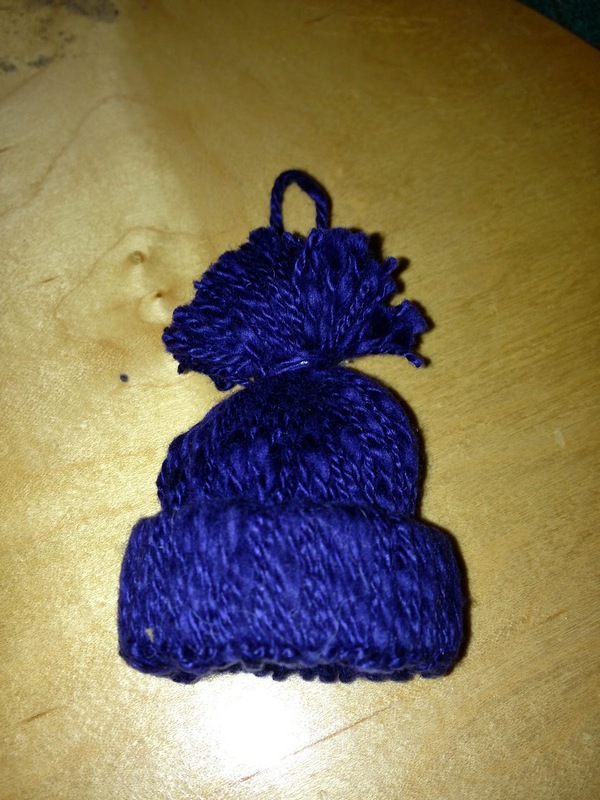 Finally, you tie the top of the "hat", trim the ends, and add a length of yarn as a haner for the ornament. The covered cardboard creates the brim and the ends form the body of the hat. 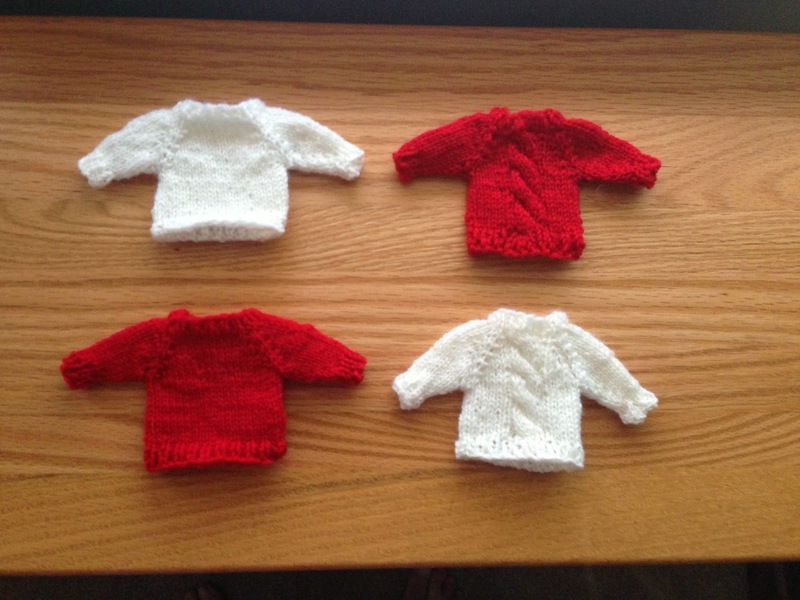 These were a lot a fun and a great way to use up small bits of yarn. It would also make a great kid's craft! Time off is great! I'm getting a TON of crafting done...as well as doing errands and fixing things for mom. 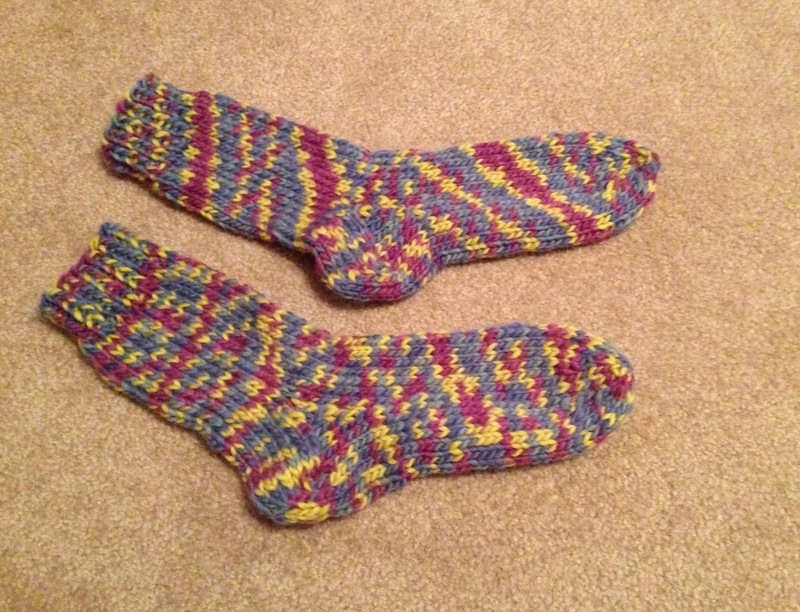 For her birthday, I made her a pair of socks. Yup. You guessed it....yet another pair of bed socks. She LOVES them - they keep her feet warm at night. This time, I was able to custom fit them since I was here! Check out the patterning of the socks! 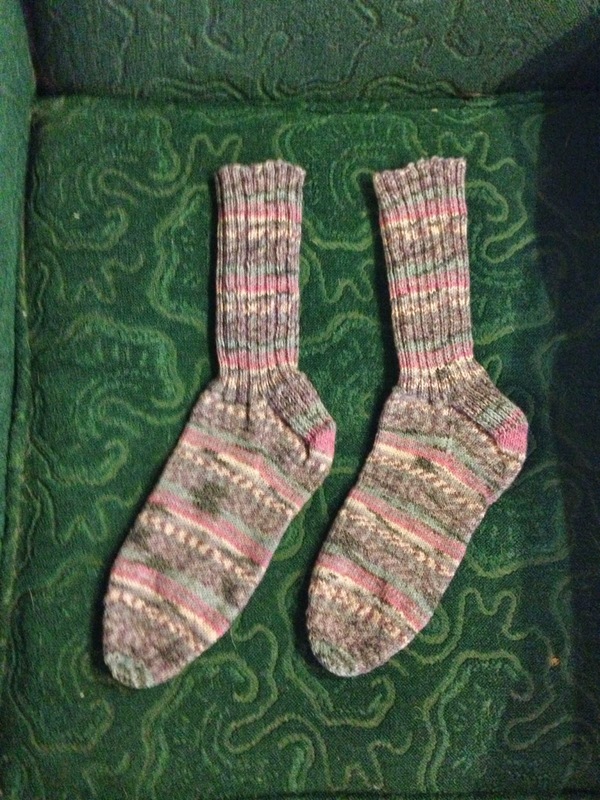 The pattern I used was "Fireside Socks" and the yarn is "Iceland". 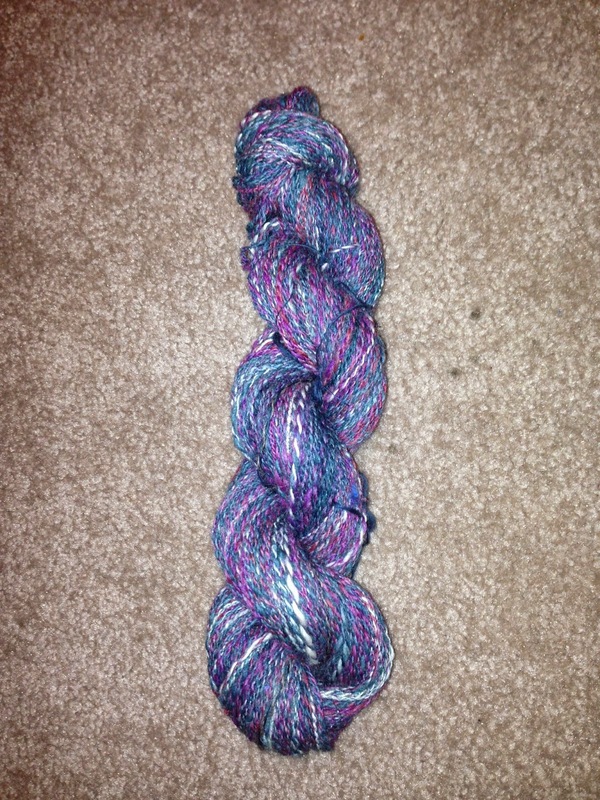 Both skeins are the same dye lot...but the end result was quite different due to the pooling of the colors. 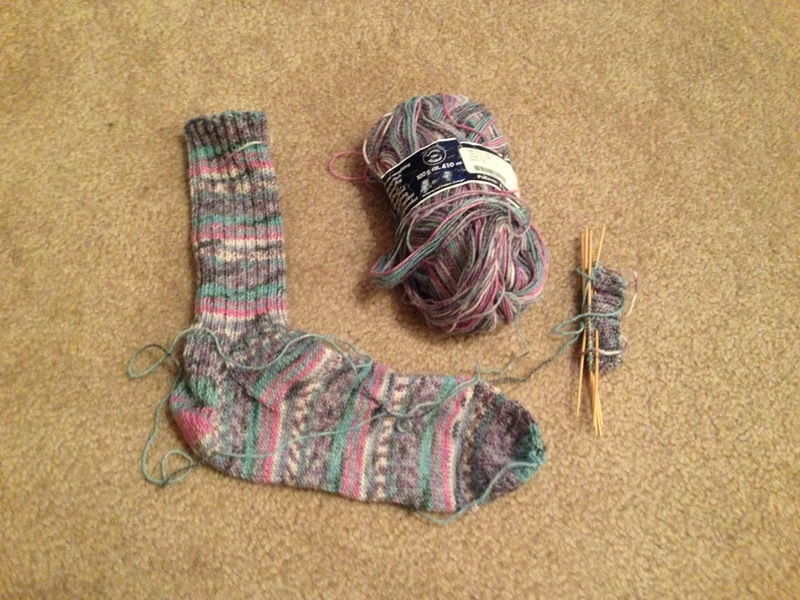 The one sock almost looks striped, whereas the other remained rather mottles. In addition to the socks and the surprise party my sisters and I put together for my mom, I had commissioned a hand crafted angel for her birthday. 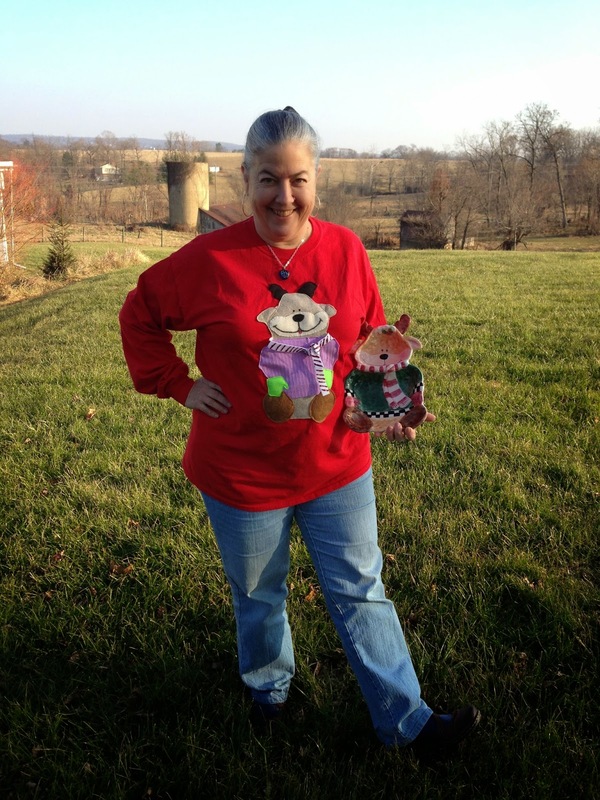 Bridgette does gorgeous needle felting....and she did not disappoint! 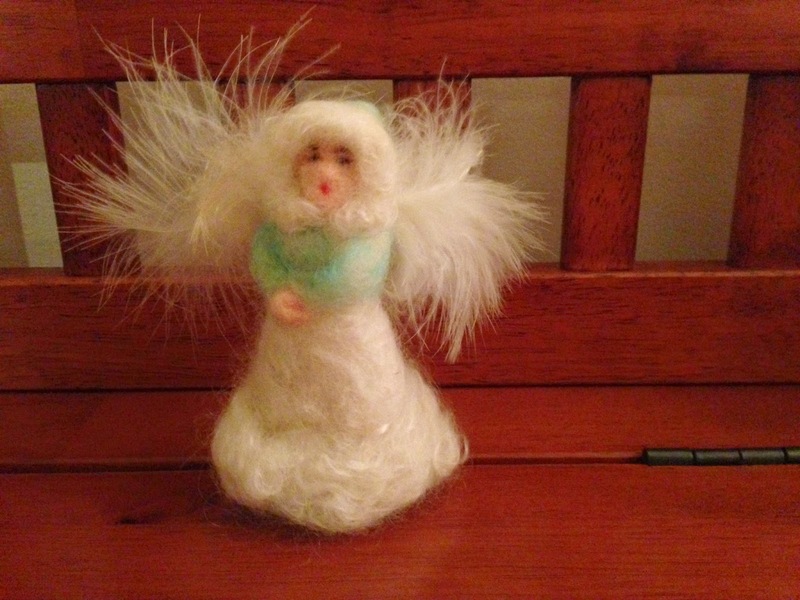 The vintage angel she created for my mom's birthday is beautiful! Another major accomplishment was that I FINALLY spun the skein of yarn for Peggy's 60th! Our spinning group had given her a basket of hand spun yarn in celebration of the birthday as well as a thank you for all her efforts keeping our spinning study group on track. That occurred in early November....without my skein. I had precious little spare time and just couldn't get it done. 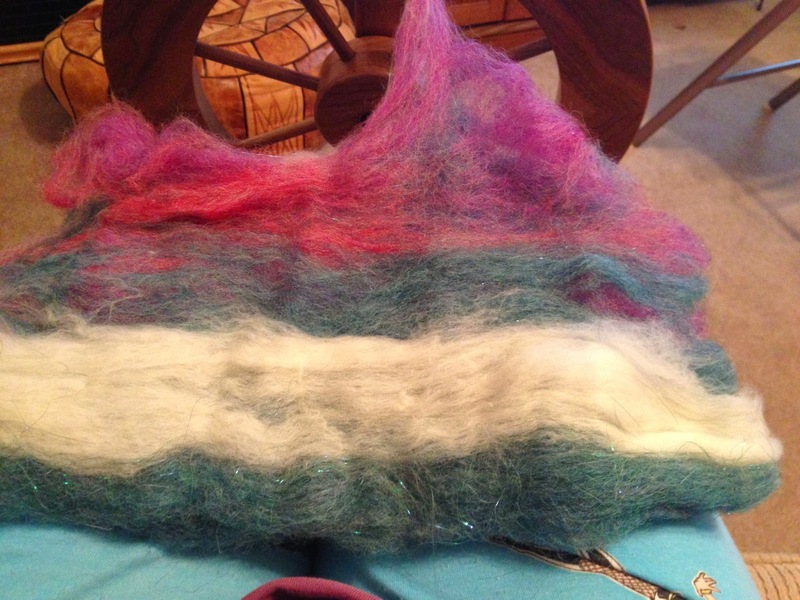 I spun up an art batt that was a combination of wools, alpaca, silk, mohair, and a bit of Angelina and Firestar. It has all my favorite colors - purples, blues, teals, and pinks. 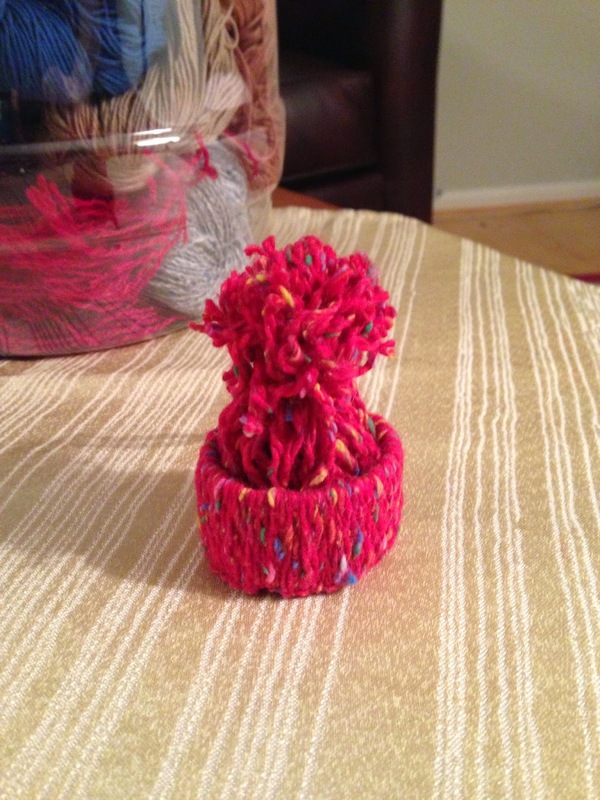 I think it's the perfect skein for Peggy - she LOVES color! 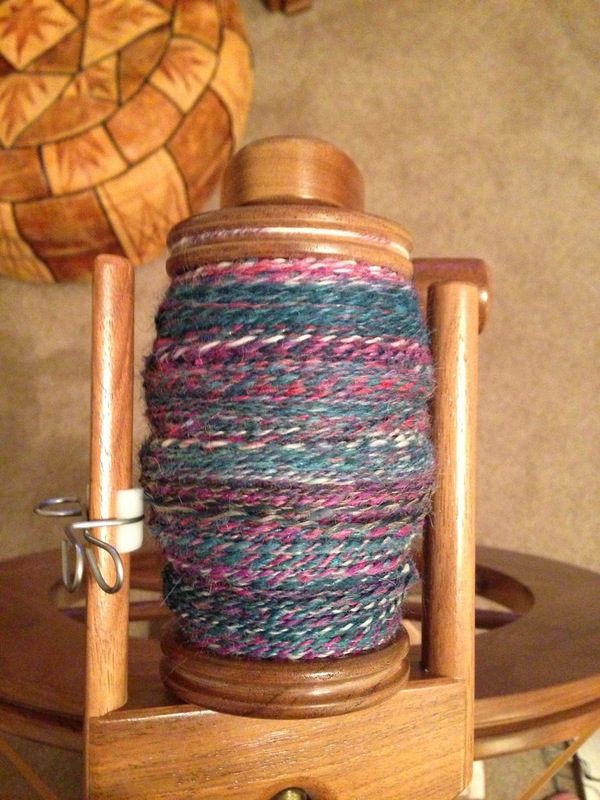 I included the photo of the yarn on the bobbin as it seemed to show the individual colors within the skein well. 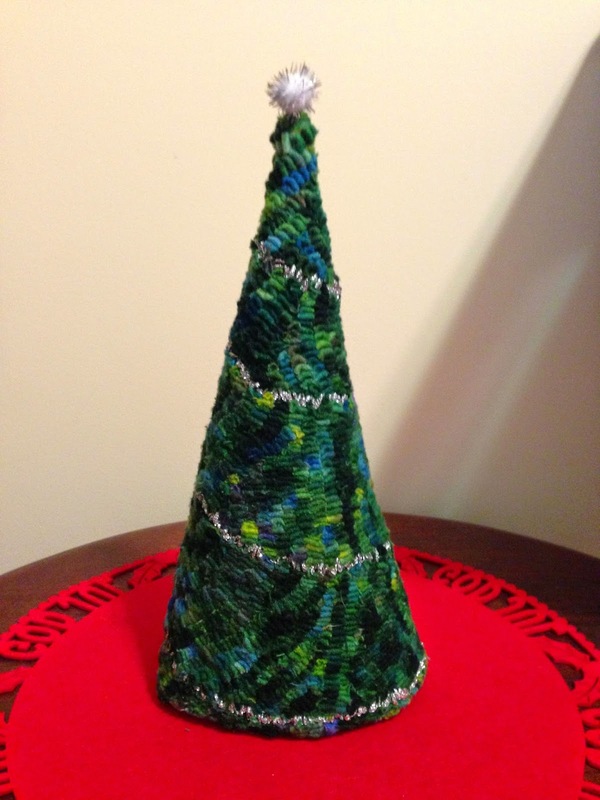 I finished with the rug hooking portion of my 3D rug hooked tree. I hate to admit it, but it was started last November......November 2013, not November 2014. It's FINALLY done! I didn't think I'd ever finish hooking it. I do have the strips going the wrong way - I hooked up and down, but should have done side to side. The problem with the way I did it is that when the ends are joined to form the tree, the curving will reveal the white backing. If I had done it the other way, it would not have shown. Oh, well. Live and learn. I'll have to see what it looks like after I have it all stitched up. 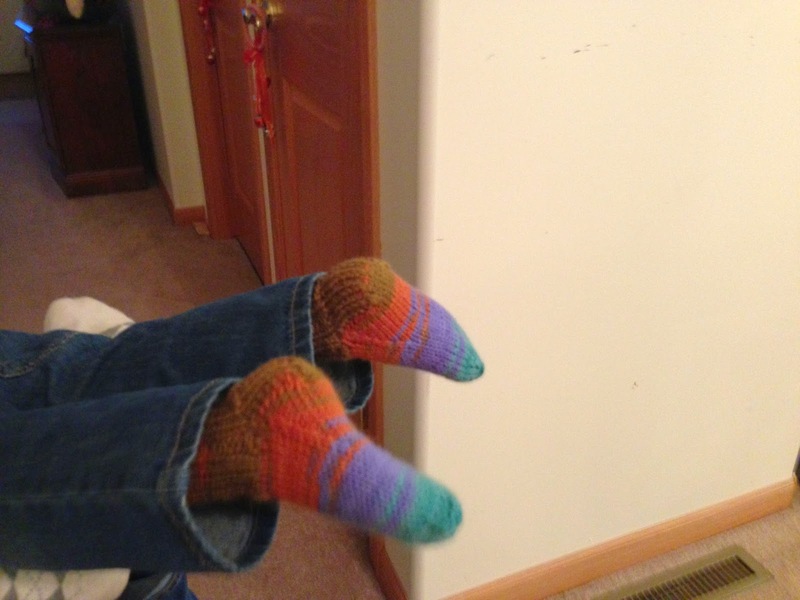 One final thing....the socks I made weeks ago for my grandson are a PERFECT FIT!!! Wahoo! Wow! This past week has been crazy! 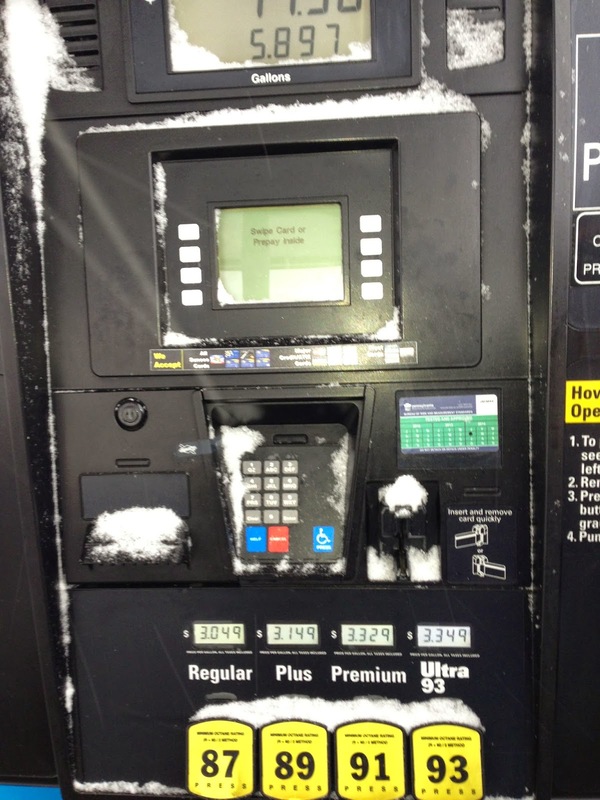 I drove to Illinois right after Thanksgiving....and got hit with some unpredicted snow squalls that made the going a bit dicey the first few hours of my trip. Thankfully, by the time I got further into Pennsylvania, they had actually treated the roads! The wind was blowing like crazy and the snow was coming sideways. And none of that was in the forecast! a snowflake button....or perhaps ribbon and a bell. 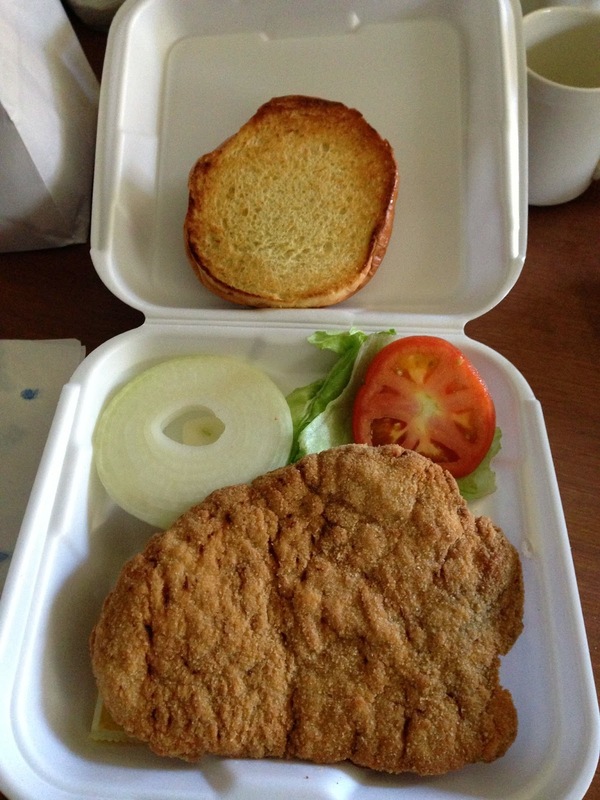 In order to keep my strength up for crafting, I "had" to get a pork tenderloin. I believe this is my most favorite sandwich. They're huge...and they're so incredibily delicious! Just add some onion, mustard, lettuce, tomato and a dash of salt and it's perfect! 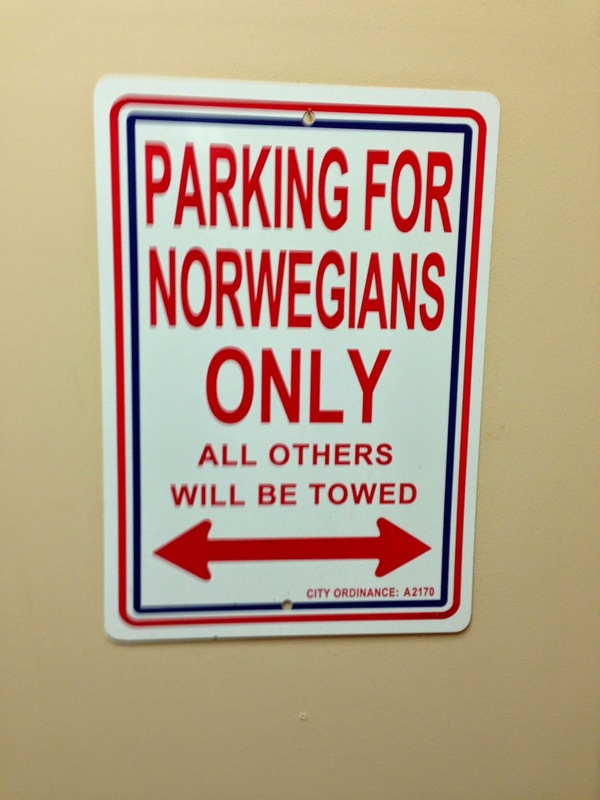 Mid-week, Mom and I hit the Norway Store to purchase lots of goodies - Norwegian candies, Lingonberry Jam, and their home made pickled herring. 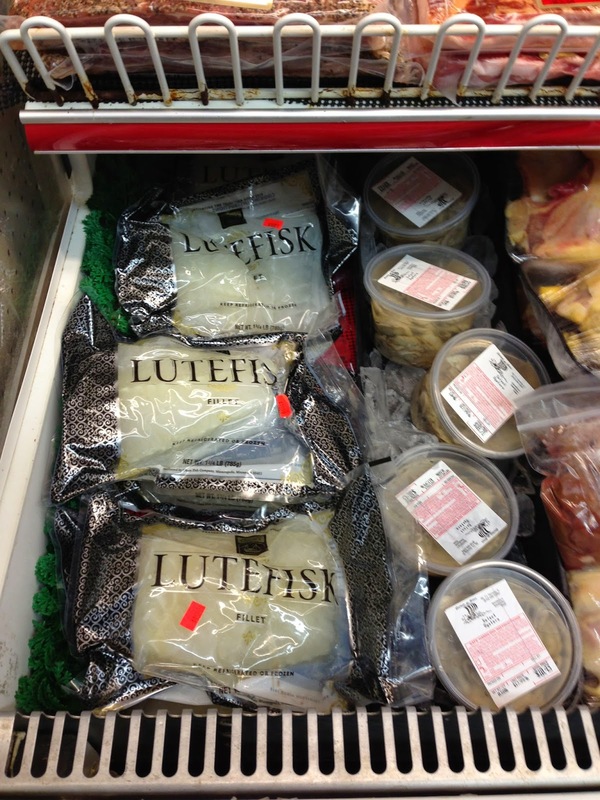 I did pass on the Lutefisk. Mom wasn't thrilled about the idea of "stinking up the house" by cooking the fish. 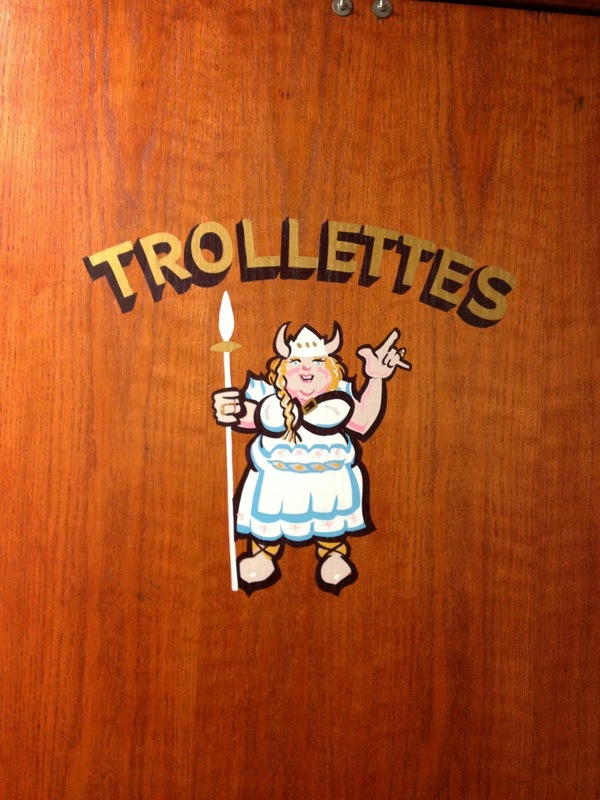 Oh....and since we were at the Norway Store on the first Wednesday of the month, we had a great lunch! 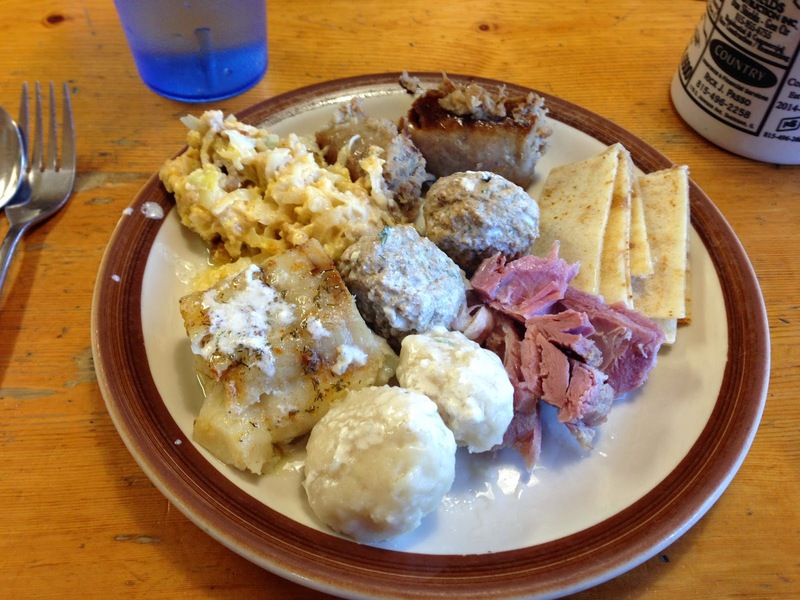 It was time for the monthly Norwegian buffet. YUM!!!!! 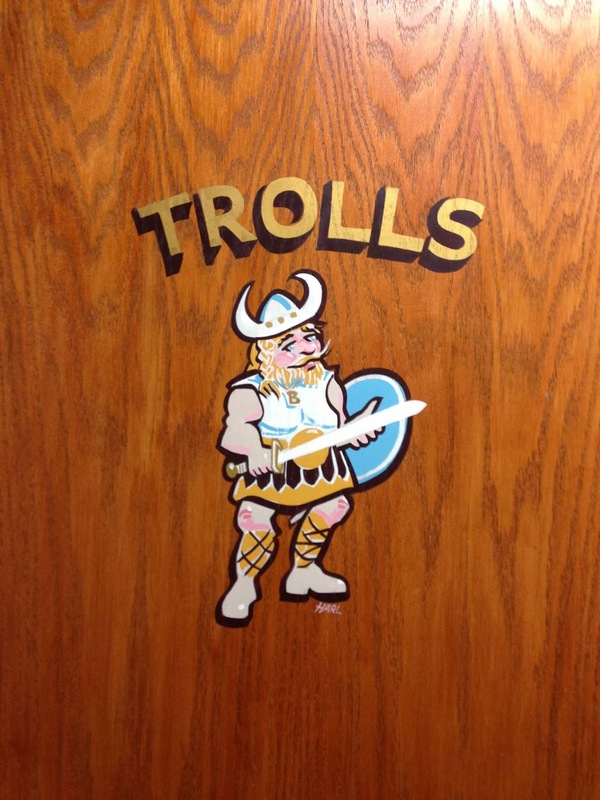 Of course, while we were there, I had to take the obligatory photos of the Troll Decor on the bathroom doors. 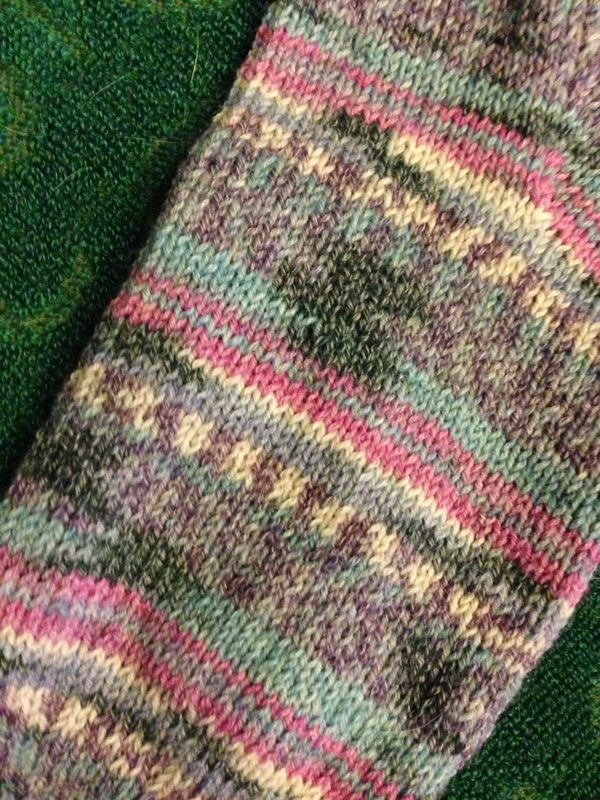 On the crafting front, I started working on the second sock of my cotton-wool socks. I had started these quite a while back, and I really needed to finish up the second sock so I can wear them! I didn't get very far on the 1st..and haven't really touched them after that. Looks like that's what my vacation will be....a bit of crafting and lots of eating! 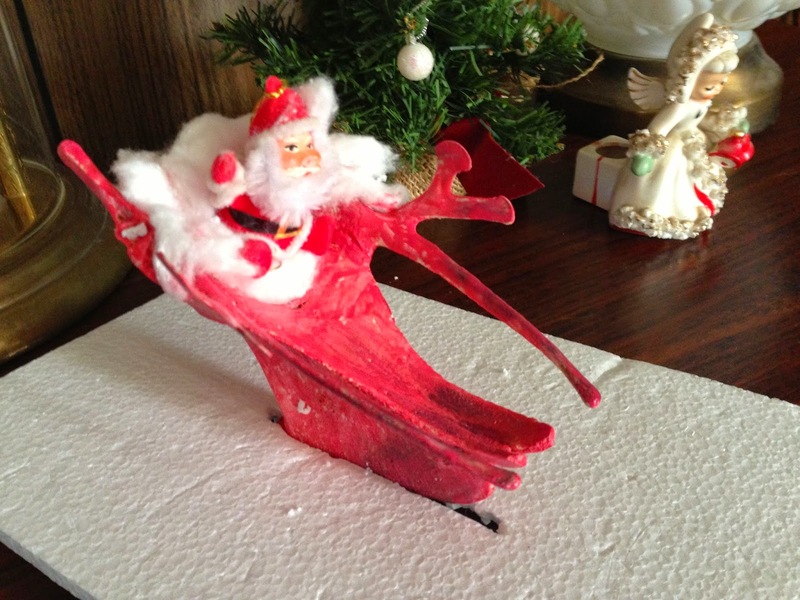 Oh...check out this cool Santa's Sleigh that my Aunt Rita crafted out of a turkey breast and some nail polish. I think it's awesome!! !